I am an Infertility Social Warrior: How I #FliptheScript 365 Days a Year! Ever since I struggled with infertility for a decade of my life, I have vowed to be an advocate for those who are still in the thick of their battle. There is not a day that goes by that I am not doing something to #FliptheScript. I received this badge for my work as an Infertility Social Warrior! I am a Proud Warrior! It took me nearly 6 years to publish my first fertility support book, titled Detours: Unexpected Journeys of Hope Conceived from Infertility. My book climbed to a #1 Bestseller (in the fertility category) on Amazon in just a week's time and still continues to be a top ranked fertility support book. The book includes my story and those of ten others whom I met through RESOLVE of San Diego while we were struggling with infertility. It is truly a testimony to RESOLVE and I donate all my net proceeds from the sales of Detours to RESOLVE. This is the cover of my Amazon bestselling fertility support book, Detours: Unexpected Journeys of Hope Conceived from Infertility. In addition, I have created my own website: www.theinfertilityadvocate where you can find my blog, resources, media events, support gifts and much more. 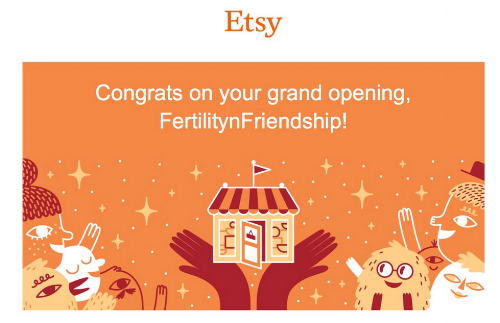 I created a line of infertility support greeting cards called "In-Fertility & Friendship" and I have opened my own FertilitynFriendship ETSY store. Please visit my FertlilitynFriendship ETSY store for the perfect support greeting card. 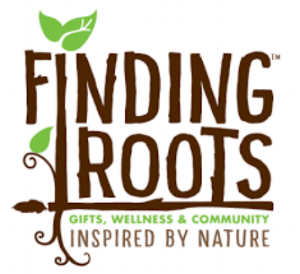 My cards and book can also be found in a local store in Michigan called "Finding Roots." The money I raise from selling my books at "Finding Root"s is also donated to RESOLVE. I have also started my own RESOLVE PLSG in Brighton, Michigan and I am in the process of starting two other groups in southeast Michigan, one in Flint and the other in Lansing. My RESOLVE Peer Led Support Group meets from 6:30 - 8:30 PM on the third Monday of every month at the Brighton District Library in Brighton, MI. In April 2018, I published twelve blog articles for NIAW, 6 of which were from the members of my PLSG which I titled, THIS IS US series and 6 were from the childless not by choice community, which I titled "Voices from the WE ARE WORTHY SUMMIT." I am religiously blogging each week to help raise awareness and provide inspiration for those who struggle with infertility. As an author and an anthologist, I empower people to find their voice on their infertility journey, which in turn can be healing for so many. 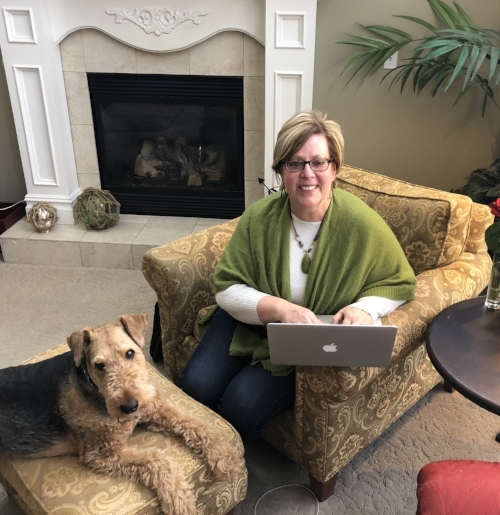 My beloved Airedale Terrier, Griff, loves to help me when I blog! I have been selected to be a RESOLVE Midwest Regional Mentor and I volunteer each week on the RESOLVE helpline. I have been a guest speaker on many podcasts and radio shows and have gained an international following from Australia, to the UK to Canada and here in the USA. I have been a guest presenter in various support groups in MI, Seattle and plan to attend one in New Jersey this summer. I have written a poem titled, "We Are the One in Eight." I have registered for and will be creating a fertility awareness art exhibit for the Grand Rapids ArtPrize in September 2018. My infertility awareness poem and art exhibit will be entered into the Grand Rapids ArtPrize starting September 19, 2018. I have attended Advocacy Day in 2017 and in just two weeks will be attending the 2018 Advocacy Day at the Michigan State Captain. My husband, Bob and I, make it our mission to attend the annual Infertility Advocacy Day in Washington DC. I avail myself to the people in my community whenever they need additional infertility support. For example, I coordinated with the RESOLVE and the contributors of my book to participate in the San Diego "Walk of Hope." In addition, I attended a memorial balloon launch when a member miscarried her baby. I led the community in a worldwide "Candlelight Vigil" in the fall for fertility awareness. I continue to coordinate with and provide educational support speakers/presenters to attend my PLSG meetings. I organize social gatherings for my PLSG. I will take dinner or a meal to a member in need. I am planning a "Pamper Yourself" party, complete with complementary massages from my certified massage therapist, on the Thursday after Mother's Day to help my infertility warriors have something to look forward to after they endure the toughest holiday of the year. My phone case captures the essence of my desire to help those who are struggling with infertility. I continue to find creative ways to raise money for RESOLVE: my Trades of Hope Fundraiser, my "Not-Yet-Mother's Day Facebook Fundraiser" and my cards and book and my JOURNEY OF HOPE wristband (which coordinates with my book) to name a few. Pictured here are my JOURNEY OF HOPE wristbands, which are available for $2. They make a great gift for those in your support group as well as the loved ones of those who are struggling. All net proceeds will be donated to RESOLVE. Show your support and order a dozen or more today! I am currently in the process of collecting stories for my next fertility support book and I would love to hear from you if you are interested in sharing your story. Now that I am a retired school teacher, being an advocate for infertility is my full time mission. I am in it for the long haul and want to do as much as humanly possible to #FliptheScript and help others get the support they need on their fertility journey. I vow to #FliptheScript and use my decade-long infertility struggle for the greater good. If there is anything else that I can do to help the infertility community, I hope you will think of me first. I am committed to doing all that I can to help others on this overwhelming journey.